Departement of Vaucluse - Pop. : 30.000 h.
On highway A7 and route N7, 600 km. from Paris, 100 from Marseille. 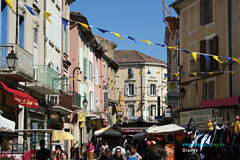 A city of art and history, Orange is outstanding for its exceptional historical heritage. As soon as you come inside the gates you will find yourself in the midst of Roman civilization with the Arch of Triumph (three arches) standing majestically over the city. 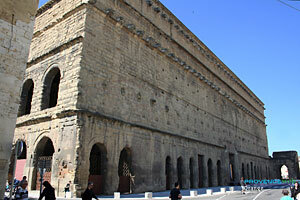 Another marvel, listed as a monument of the world, is the famous Antique Theater built in the early days af Christianity. 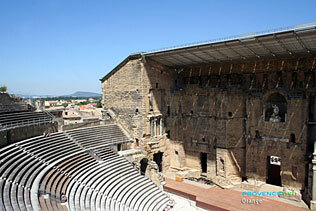 It is the only Roman theater in Europe to have conserved its stage wall. Today, thousands of spectators attend various cultural events held here. The old city should also attract your attention with its narrow streets, well restored façades, and its ancient shady squares. 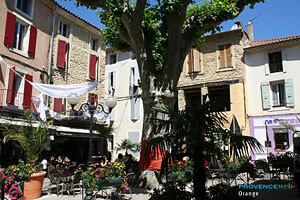 The heart of Orange has such an aura of old fashioned country Provence that one would believe oneself in a Provençal village! The greatest pleasure is just strolling about taking in the charm and discovering the treasures. Antique Theater. 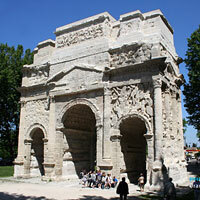 Arch of Triumph. Colline St, Eutrope: a pleasant walk up this hill which is rewarded by a panorama of the city. Bowling. Swimming pool. Golf. Bike rentals. Jonquières (8km), Camaret (6km), Caderousse (6km), Piolenc (6km).